The artist’s largeness of conception and perfect control of color are nowhere more evident than in this miniature, with its masterful simplicity and its harmony of tan, gold, pale green, violet, and blue. He has introduced new pictorial devices, such as the almost transparent loincloth and the equally transparent water that spills over Christ’s head and body, ending finally in the marvelous limpid blue of the pond in which he stands. The painter has shown the Jordan more as a pool than a river, and the miniature is unusual in other respects. For example, the Baptist holds a situla, a sort of bucket or pail with a handle, which suggests an association between the water he pours from a scoop—oddly with his left hand—and the baptismal water mixed with oil and chrism blessed annually on Holy Saturday. Christ bends humbly forward with hands crossed on his breast, a position that, though popular later, was rare at the time. 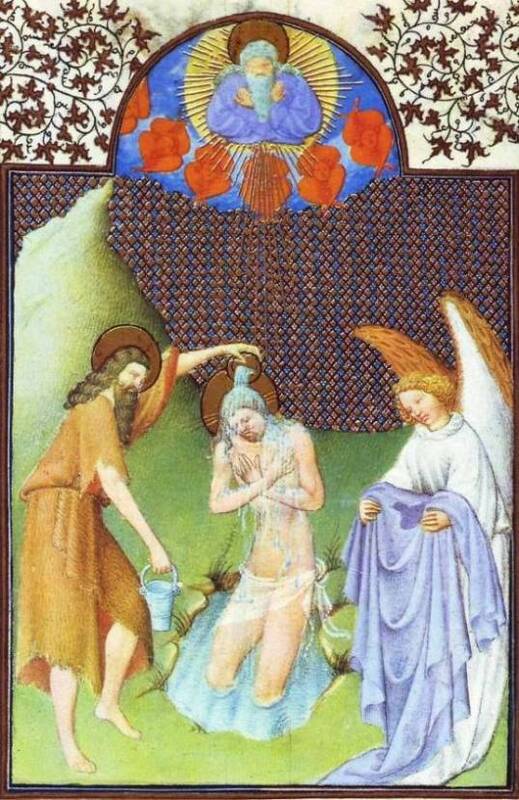 One unusual aspect—the omission of the Holy Spirit—the miniature shares with the Baptism in the Duke’s Tres Belles Heures de Notre Dame, painted shortly before. Since the Trinity was first mentioned on this occasion artists usually represented it by painting a dove above Jesus’ head. Here Paul preferred to preserve without interruption the mosaic of red, blue, and gold which extends from the fiery cherubim supporting the figure of God the Father, to the bowed head of the Son. He stressed, however, the unity of the God-head, by giving the Father and the Son the same gesture of crossed hands. He also dressed God the Father in a robe of violet, a shade deeper than Christ’s seamless garment, which is so beautifully displayed by the angel.